For three days each year, an organic farm in bucolic Glen Rock, Pennsylvania, transforms itself into Faerieland, and people of all ages come from far and near to frolic with the faeries. 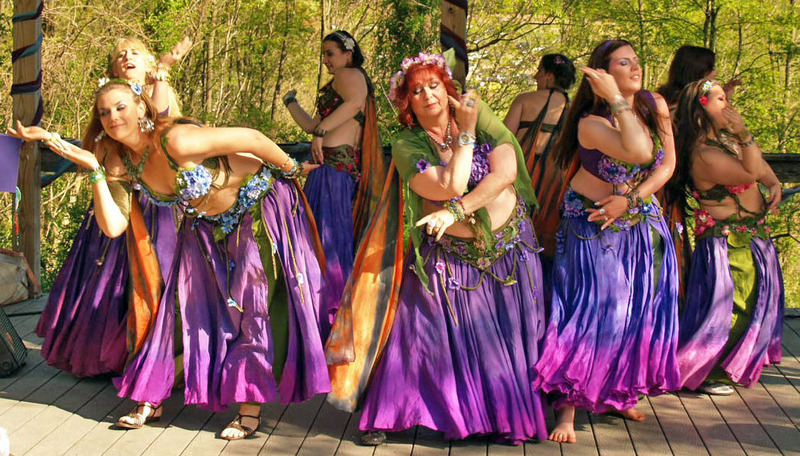 The Aubergine Dancers are regular performers at Spoutwood Farm's May Day Fairie Festival. Photo by Gina Montanarelli-Myers. Used with permission. Those magical words tell me it's time to get ready for an annual May Day tradition in this part of the world, the Spoutwood Farm May Day Fairie Festival. 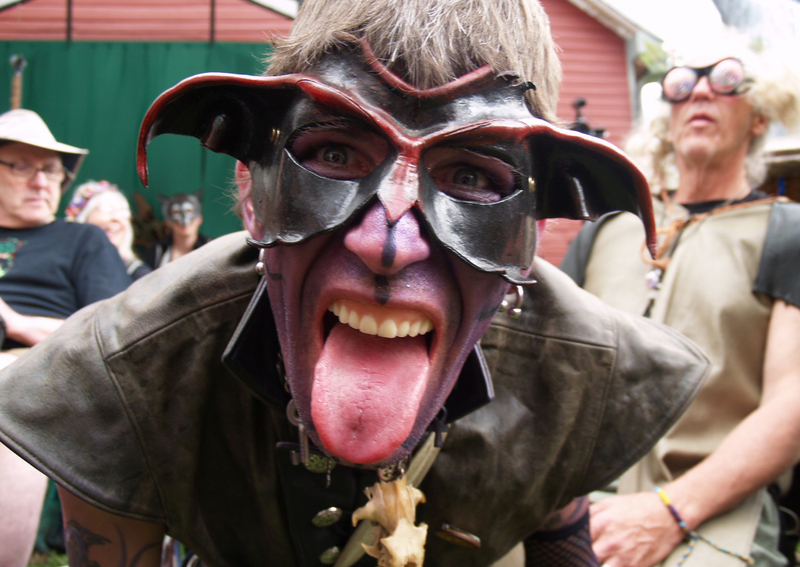 For three days each year, an organic farm in bucolic Glen Rock, Pennsylvania, transforms itself into Faerieland, and people of all ages come from far and near to frolic with the faeries. If you love music, dancing, and costumes, and if you (or your kids) love magic and make-believe, this might be the festival for you. Right: Festival-goers often wear fanciful clothing and masks. Make sure to wear your finest faerie garb! Photo by Gina Montanarelli-Myers. Used with permission. They've added to this core of May traditions some elements of a music festival and others of a renaissance fair. Want to buy chain mail armor, a flower garland for your hair, or a toy dragon? You can find vendors selling all those things, along with fanciful clothes, fairy wings, sculptural masks, and other handcrafted items. Want to listen to mellow harp music, driving trance-dance bands, or bagpipes? You'll find all that on the various stages. Want to get into the flow of a good drum circle, watch modern belly dance, or just have a killer veggie burrito? It's all there. Rob and Lucy Wood, owners of Spoutwood Farm, were the Spoutwood Farm May Day Faerie Festival's King and Queen of May in 2011. Photo by Stephanie Hall. Used with permission. In addition to all this, there are faerie-themed activities for the kids: tea parties with the faeries; interactions with friendly sprites, gnomes, and goblins; a puppet theater; a pixie post office; and tours of The Fairie Village, where tiny homes have been built into the landscape and kids can imagine the little occupants. Finally, the festival has an educational component. There's a "Nature Place" where you'll find information on animal rescues, conservation organizations, farms, and purveyors of natural foods, herbs, and soaps. You can learn about the festival's philosophy of "zero waste," and see how thousands of people can come together and still tread lightly on the land. Goombah is really friendly when you get to know him! Trust me! Photo by Gina Montanarelli-Myers. Used with permission. I've been attending the festival in various capacities since 2007. Over the years, I've been there as a speaker in their "Chautauqua" series of lectures and workshops, as a singer with the Celtic rock band OCEAN orchestra, and even as a plain old audience member. But for the last five years, I've been attending as Wynken de Worde, the festival's Master of Ceremonies and Bard. 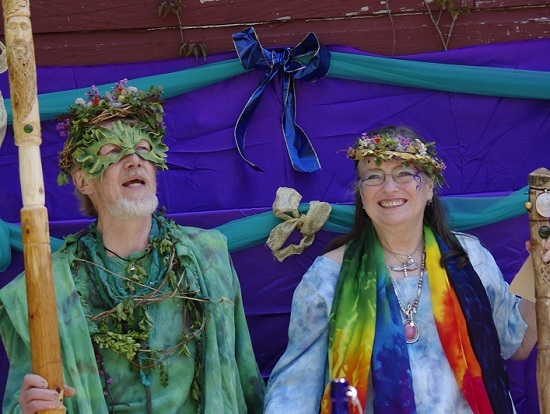 My role is to use my knowledge of folklore to help create and host opening ceremonies and midday ceremonies, including the blessing of the stream and maypole, the coronation of the King and Queen, and the gathering of the faerie tribes. We even pick a little prince and princess each day! You'll find us on the Royal Maypole Stage. 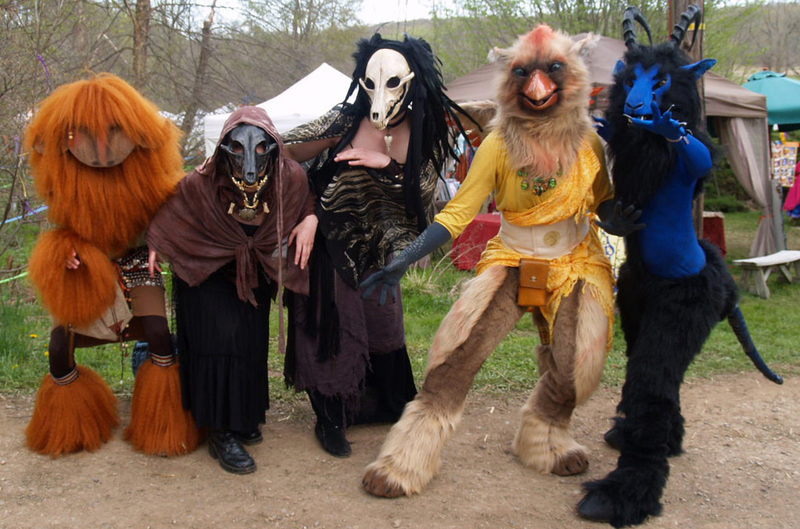 Magical creatures of all kinds roam the festival grounds. Photo by Gina Montanarelli-Myers. Used with permission. 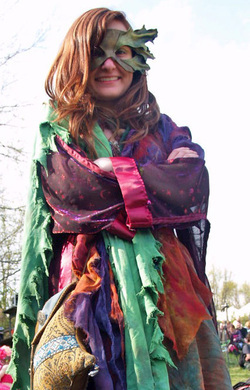 The Spoutwood Farm May Day Fairie Festival is the oldest faerie-themed festival in the country, and the largest in the Eastern United States. My first year as MC was the festival's twentieth, and this is its twenty-fourth. Since I started attending, a few notable events and changes have happened to the festival. A full-length documentary, Glen Rock Fae, has spread the word to a lot of new folks. Watch the trailer below! This year we created a new backstory for the Spoutwood faerie universe, which you can read here. We're also introducing storylines to each year's festival, much like a Renaissance fair. This year's involves the emergence of an embassy from the Dark Faerie Realm, a slightly wild, Goth-inspired outpost of the faerie community. The festival runs from Friday to Sunday, May 1-3. You can find out more, purchase tickets, or even volunteer, all on the festival's website. 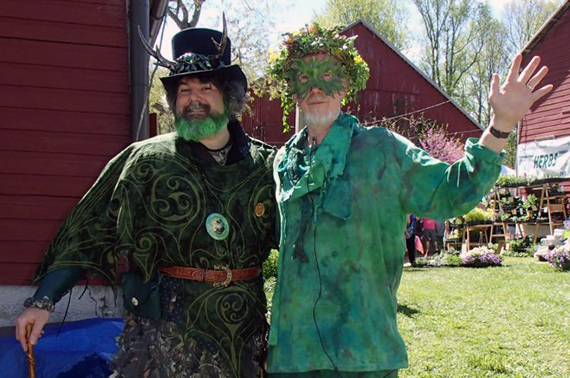 Wynken de Worde and The Green Man, a.k.a Stephen Winick and Rob Wood. Photo by King Trolland. Used with permission. Spoutwood Farm is located in beautiful Glen Rock, in York County, Pennsylvania. It's less than ten miles from the Maryland border, less than fifteen miles from York, PA, about thirty miles from Lancaster, and about thirty-five miles from Baltimore. Your visit can be part of a weekend that includes urban exploring, small-town antiquing, driving through rolling hills and fields, or all of the above. Just beware; as travelers like Thomas the Rhymer have learned, time sure flies when you're with the faeries!